A deep depression ended our run of hot weather with a real humdinger storm! Banyandah lay inside the small harbour at Strahan, alongside a crayboat. Along the outside of the jetty were several other fishing vessels, the crew except for one deckie had gone home after landing their fine catches. Storms often give no warning. They just strike with big gusts that just keep getting bigger and bigger. We knew it was coming and had doubled our fore and aft lines, but its ferocity and direction soon whipped up a nasty sea, and the flat bottom “Westcoaster” next to us starting rolling as if ready to leap out the water! Then the heavens opened and buckets of rain came down. 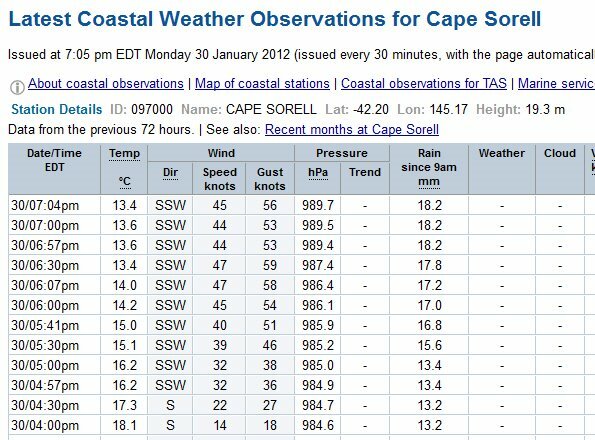 Gusts of 59 knots (110 kph) were recorded a few miles away at the cape. 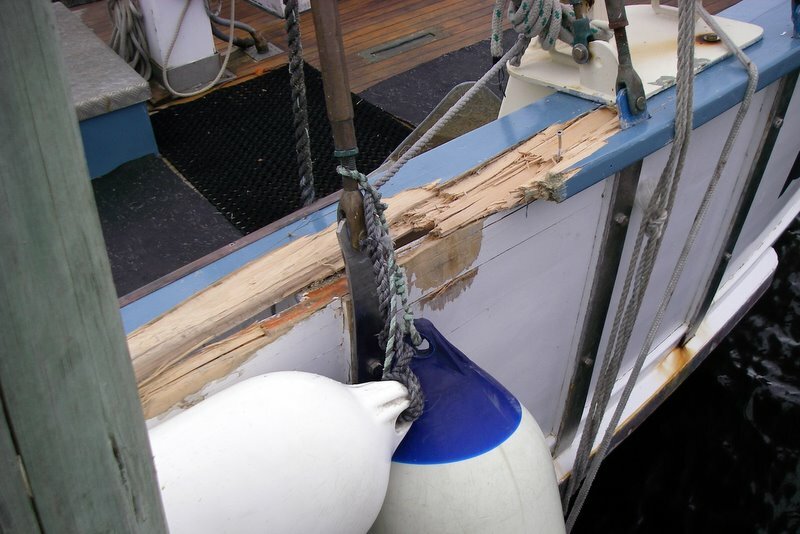 I took two more lines ashore so we could ease away from that rocking monster next to us, and while doing that heard splintering wood and crashing of the beautiful double ender “Breaksea” of Huon pine from Hobart. 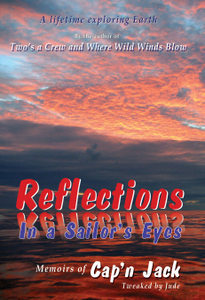 She had slipped her fender from between the pile and was ripping her bulwark to pieces. My puny arms were no match for the power of Nature although I valiantly tired to slip fenders inbetween, watching I not get my hand or fingers crushed. Finally some crew came running from the pub and lent a hand, but damage had already been done. We spent most of that night being jerked by our lines till the storm eased in the wee hours. ARE WE PLAIN STUPID? OR JUST HUNGRY? 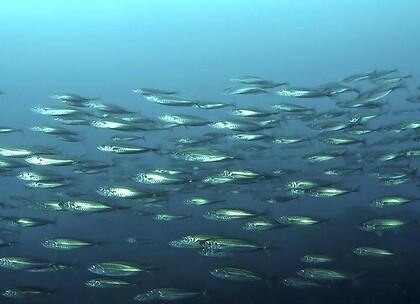 Where Have all the Fish Gone is a disturbing article on the demise of Earth’s wild fish. Stocks have dropped to less than a tenth of that in two decades. The world’s largest trawlers, after depleting other oceans, now head south towards the edge of Antarctica to compete for what is left. Isn’t it time to seriously discuss reducing world population! Taking out GOLD in Tamworth! 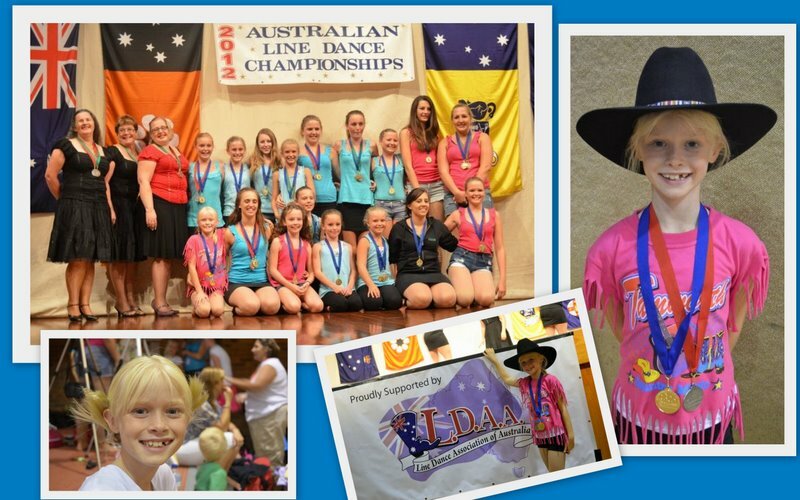 Our beautiful grand daughter Emily and her dance group from Lennox Beach dance group won the Australian Line Dance Championships. A Big Congratulations Emily Rose Binder for taking out a Gold and two Silver Medals. 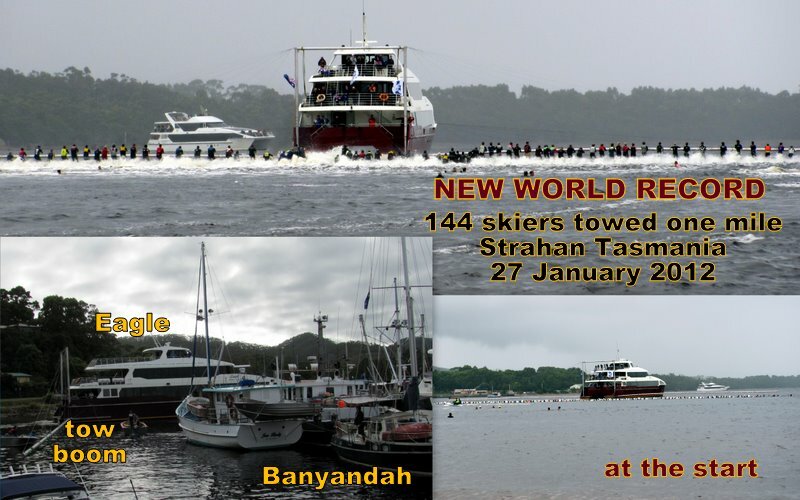 NEW WORLD RECORD AT STRAHAN ~ 144 water-skiers towed for one mile. Increases previous record of 114 set two years ago when we were here too. Yesterday’s failure in poor conditions did not deter the volunteers who were rewarded with perfect conditions this morning. Great spectacle and an even greater achievement. Congratulations to all. Two abalone boats in this morning each with 5 to 6 tonnes. $50 each abalone, that’s the going rate per kg in shell. 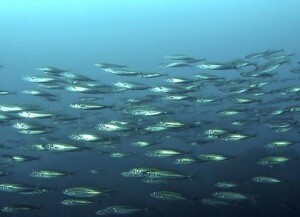 Largest Tasmanian fishing industry, 65% exported live to Asia live. 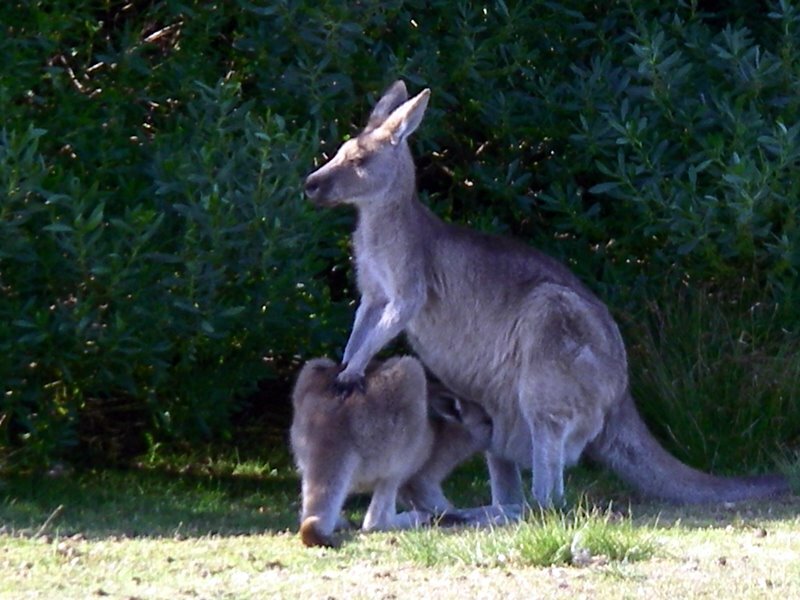 Climate change is increasing the threat of introduced species. 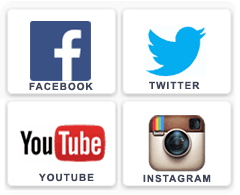 Are we managing this correctly? 2,500 tonnes harvested annually – that’s approximately 2.5 million creatures. 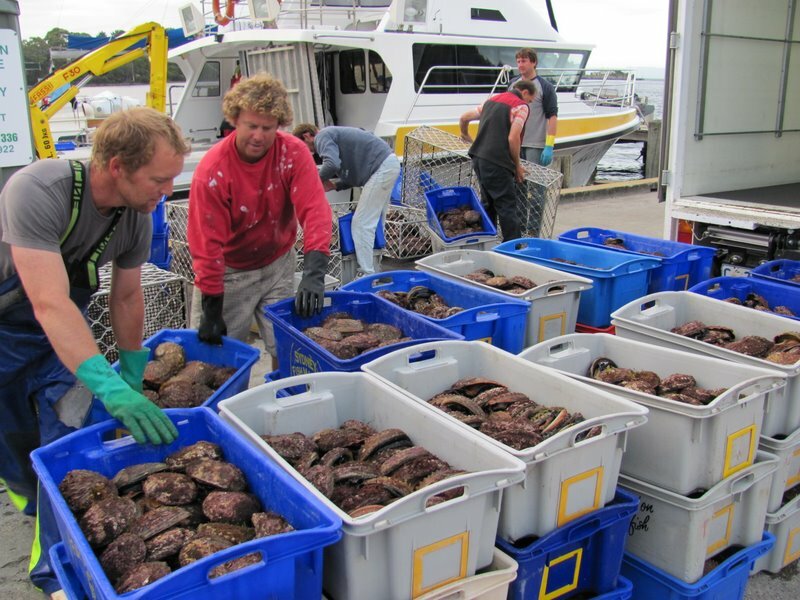 The Tas Abalone Council claim “Whilst almost every other wild fishery industry is suffering the burden of near-sighted policies… in stark contrast, abalone is revelling in the benefits of thoughtfully controlled management by industry participants.” Hmmm me wonders? We were stiff from yesterday’s kayaking, but nevertheless relaunched the green machine into the calm early morn then set off to explore the Bird River. We’re trying a different stroke this morning, one arm stiff and fixed, the other pushing forward. Takes a bit of getting used to and sometimes we clashed paddles, so one of us calls cadence. 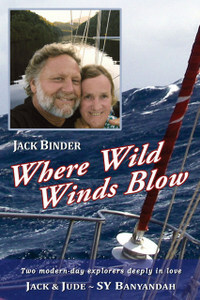 Max and Marie left for Pine Cove and shortly after we had our awning down, mainsail uncovered and engine ticking over. Outside Kelly Basin, a light SW breeze propelled us at little more than walking pace, but with the wonderful scenery, we sat in silence enjoying Nature’s parade. 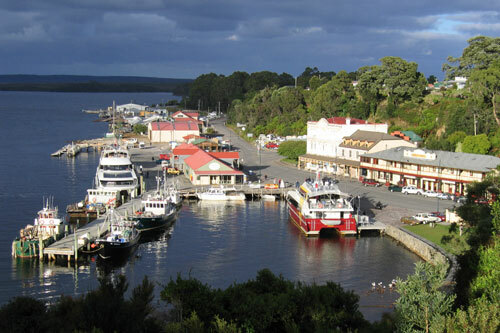 Just past lunch the breeze found its strength and off we went at pace towards the township of Strahan. Leaving behind the ‘no contact zone’ our mobile phone soon found a tower so Jack slipped aft to answer mail and pick up the latest news. And by the time he’d gotten us up to date, Banyandah was swiftly slipping past Regatta Point with our mate Trevor on the phone. Looking out his front window at us sailing in he said, “The wind will follow you round the point.” Meaning we’d not have to alter our sails for a flash entry into his sleepy hollow. 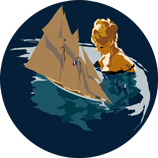 Trev invited us to raft alongside his charter yacht “Stormbreaker” which was grand as the boat harbour was chock-a block with two immense maxi yachts, and soon we were gliding in beside Trevor’s 73’ steel ketch. Securing us into his berth, he then ran off to collect our mail. Now that’s a great mate. 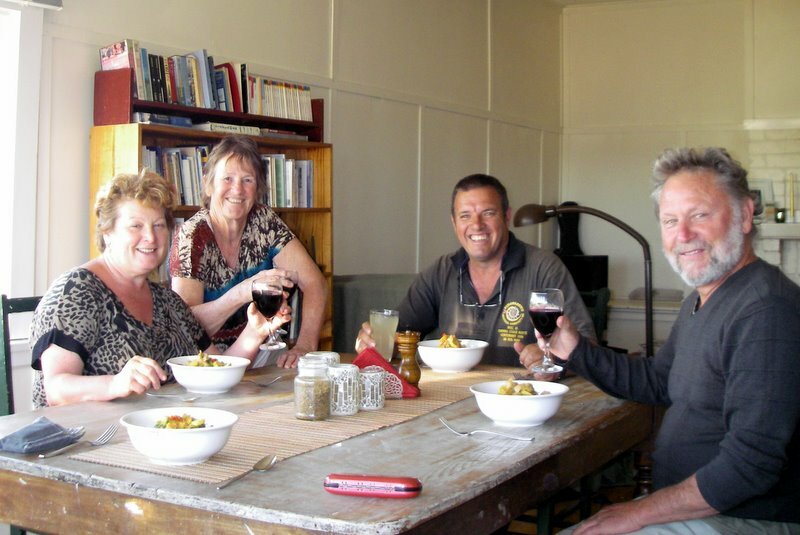 Anyone looking for a wonderful cruise up the magic Gordon River or a few nights accommodation in Strahan contact Trevor or Megs. We made the effort of paddling against the wind around Soldiers Island to see how hard it would be. After yesterday’s training run, our strokes were easier to keep in time and although today’s distance was greater, we managed a better time than our first outing. Found a very quiet spot in the SW corner of Kelly Basin with a nice sandy beach; Yvonne and Anthony were there along with Max and Marie, but it was too hot with too many March flies to think of cooking a meal on a fire, so we ate at home then went back for after dinner drinks. Fixed the green machine’s rudder pin and made new rudder lines. All looking good, except rudder holder is loose and out of place, needs some investigation to work out how to fix. Chris and Suzanne departed for the Gordon River and soon after we set off for Farm Cove. Beautiful, sunny, calm and magic to see Mount Sorell in profile. Her rocky ridges, white against the dull Irish green of her button grass slopes so bold and challenging. Jude baked bread and after a delicious lunch, we launched the green machine and set off for our first double paddle. 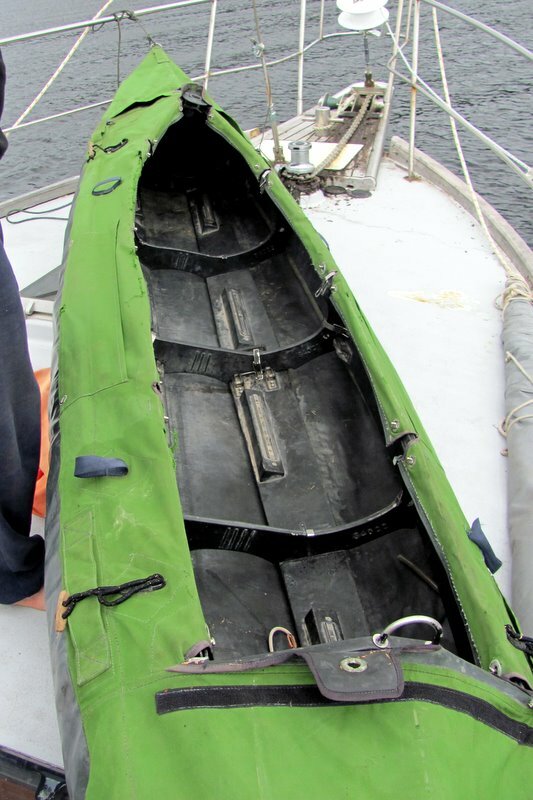 The kayak seems fairly stable when loaded and pushes through the water with minimal effort. Hopefully in time we’ll get our paddling routine down to a thoughtless motion, but today Jack had to concentrate on Judith’s stroke or smack paddles, while at the same time he watched our direction and steered with the rudder. We went up to the top of Farm Cove encountering several families of black swans. They’re so shy, or maybe wary, and wouldn’t let us within 200 m before taking flight. Lovely sight, their wings flashing in a blur of black and white reflected off the still water, their long necks stretched out. A hasty breakfast lead straight to launching our new second-hand folding double kayak we call the green machine, and surprise, she floated! Well, not really a surprise, but what was, fearing she’d flip, Jack got in with a whole bunch of shaking and rolling, especially when untying her harness. The green machine paddled easily dripping cold harbour water off the oars into his lap. 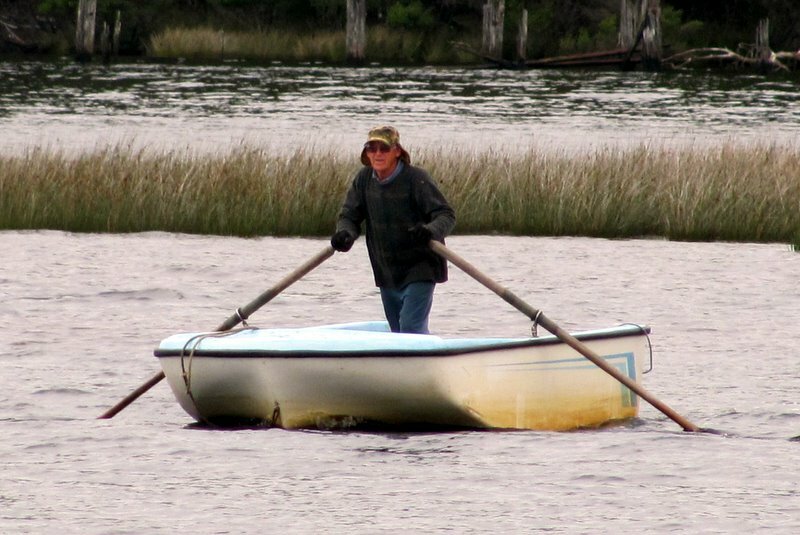 Jack soon remedied this by raising the oars less out the water. He found its tiny rudder actually turned the brute. All is apples! About ten, after hoisting the green machine out the water, we joined Chris and Suzanne for a walk up the Bird River. 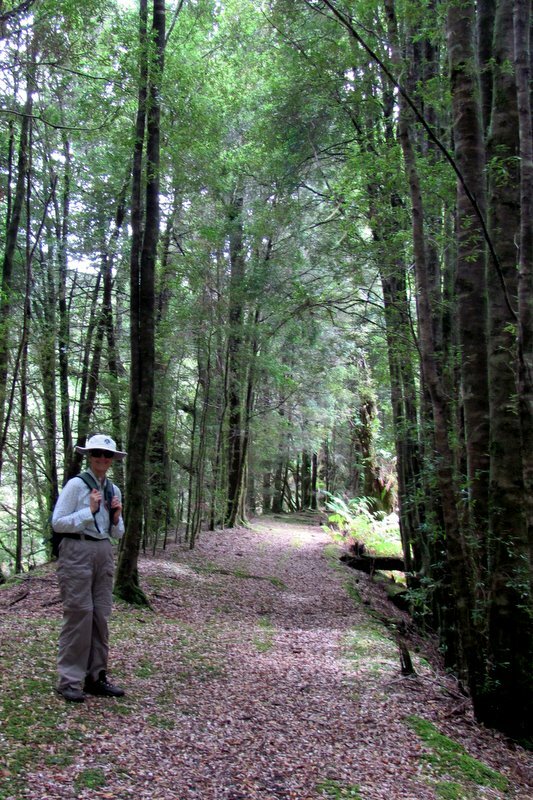 Picture perfect weather, green lush forest, in fact, too lush, the track overgrown with bracken ferns. Wonder why Parks would let one of their premier walking tracks become so dangerous. Had to be very careful finding footing amongst the tangle of tree roots crisscrossing the Earth’s surface. A shower of white petals drifted through the super fresh air as we followed the river until it noisily raced through the gorge, raising the day’s tempo. Sunshine filtered through small leaf myrtles, the fallen ones carpeting our path. For two hours we marched through a changing parade of small wonders until the Bird River Bridge hove into view. Then quite suddenly our day was shattered by sighting an ungodly modern plastic grating running the length of that historic bridge, ruining its aura. This massive wooden structure has supported freight trains and has withstood the ravages of Tasmania’s west coast weather for more than eleven decades, and had become graced with a carpet of lush mosses. Now Parks in their wisdom has decided to install plastic grating plum down its middle. It was still massively safe without any fear of falling off its exposed sides, that is until now, as there are small timber beams holding the grating in place, something to trip over and fall to your death. The money would have been more wisely spent on signage as there is not one information sign describing flora or fauna on the entire walk. No wonder we can’t get families into the bush, can’t inspire children to respect planet Earth. 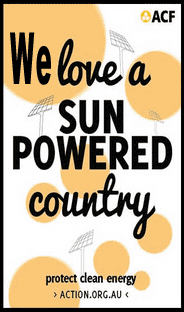 The whole system needs a shake up. Upon our return home, with Chris and Suzanne, we went over Trevor’s chart of the Gordon River and Jack copied our waypoints for their use. Chris photographed our chart so at least they are better prepared. Bon Voyage Reliance. Light rain overnight washed the sea salt off the railing and glass, leaving Banyandah sweet again in the misty morn. Max and Marie shifted to in front of the Bird then Max rowed up that small river, so we pulled our hook to say hello. No sooner had we parked besides them, then a clinker longboat whizzed up with two our age who introduced themselves as Anthony and Yvonne, friends of Max and Marie. Just then Marie popped out her wheelhouse and there was much hullabaloo greeting old friends. Max appeared just at that moment cross rowing his mammoth flat bottom tender out the river reeds and soon we had all four on board for hugs, kisses, and a cuppa. Well, the stories began flowing like the Bird River in flood and each one bigger, funnier until the sun’s warmth got replaced by a chilled wind. A quick bite of lunch then Anthony and Yvonne took us off for a walk between the two old Pellinger townships, on a track that has been condemned and lost for years. These two walkers keep many old tracks open, marking the way with fluorescent ribbons. 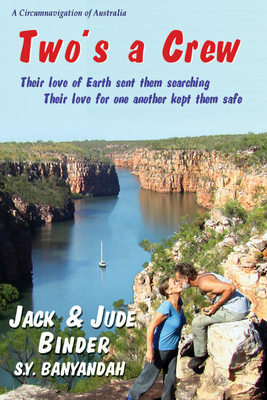 Jack and Jude had negotiated some of this track three years earlier, but had given it away where a fallen tree across a tea-tree stained creek had to be crossed without any support. Anthony has since put up a rope for a steadying hand line, and once across, we were swallowed by thick bracken with occasional glimpses of what had been the rail bed. Our journey took us past an old explosives cave then past what once had been housing, with views of the foreshore until the stumps of the original half-mile long jetty rose from the black water like rotten teeth. 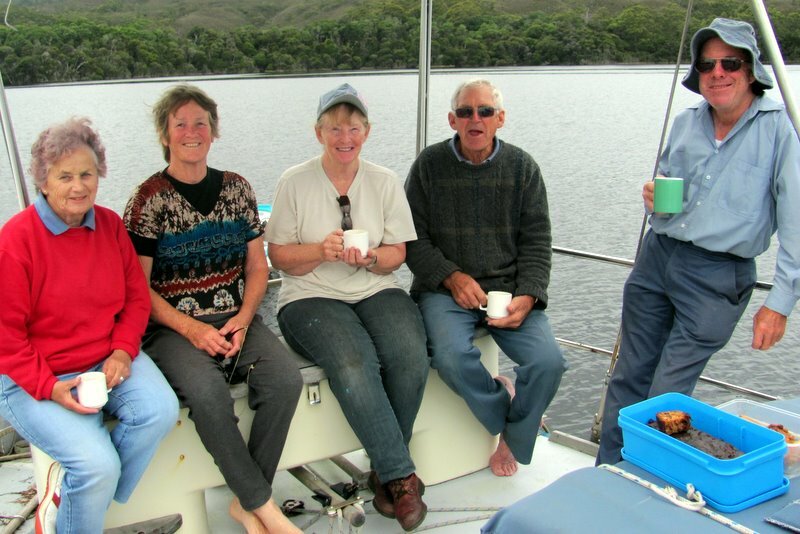 While doing this, Chris and Suzanne arrived aboard Reliance and so after a cuppa on board Max’s Fear Not, we shifted anchorage to join their vessel at West Pellinger. All this day, our folding kayak has sat half assembled on the foredeck. Jack is struggling to figure out its assembly. Late in a cool evening breeze, it finally took shape with inflation of the four bladders. Tomorrow will be her first float. 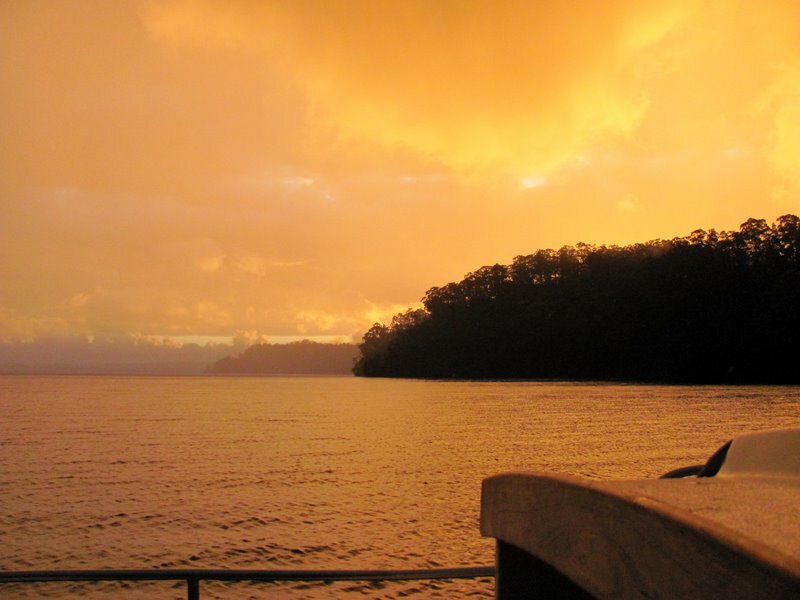 With only one safe haven in a coastline exposed to the world’s fiercest winds and largest ocean waves, the overnight voyage down Tasmania’s west coast requires careful planning and no surprises from the weather. Southwest winds are the norm along this coast, headwinds when going south, but preceding a cold front, northerlies prevail. Therefore when a narrow window of favourable weather appeared on the weather charts, we decided to take it knowing if the cold front arrived early, we’d be slammed. Just as frightening, the strong northerly would generate huge seas making the passage through the much-feared Hell’s Gate a test of courage and boat handling skills. 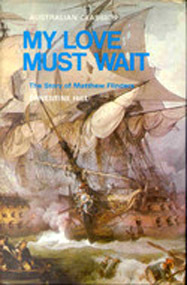 The voyage started well enough, except for the unexpected contrary current through Hunter Passage into the Southern Ocean. Once past Cape Grim, with its futuristic array of giant white wind generators, we settled into an easy sail down a vacant coastline little changed since Abel Tasman’s voyage of discovery in 1642. That night’s sunset seemed to linger as if holding back the approaching windstorm. Alas, it had to flee, and as it did the wind began to moan ominously. Coming from a land of green and granite, wavelets grew to become lines of white soldiers marching with increasing strength. 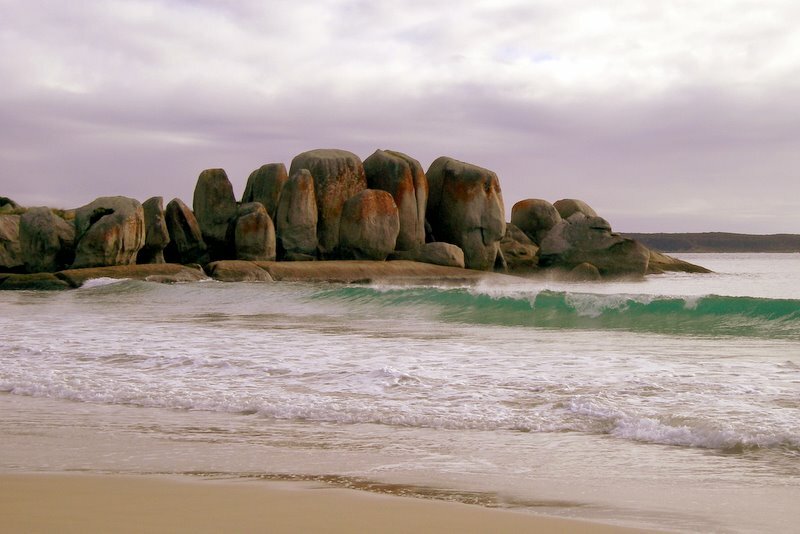 Banyandah hugged the shore to help keep their ferocity down to an occasional wetting. But as the night grew darker, they grew bolder, screaming abuse, slinging spume over our ship. Holding a course line just outside that coast’s dangerous rocks minimized the wind blasts, but it didn’t reduce our boat speed. Recording such a fast passage came the problem of a predawn arrival. We had already reefed the mainsail and then at the change of watch we lowered and lashed it. Under tiny headsail alone we kept pace with the waves, making a slow, passage through stormy seas that heightened our apprehension with its noise and motion, robbing us of much needed sleep. 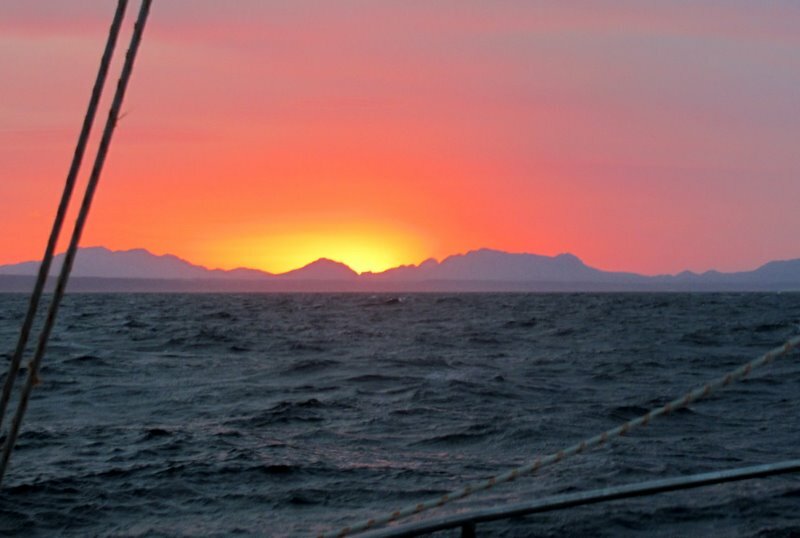 A red dawn backlit Tasmanian mountains and cast an eerie glow across dark seas. Ahead, our date with Hell’s Gate loomed and instead of breakfast, more coffee was gulped while we scanned the fast approaching coast for our destination. Through sea fret and mountain mist two white lighthouse towers rose above the line of breakers. A last check before lee-boards closed up the boat. 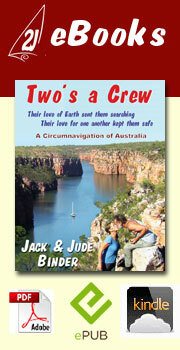 Then Banyandah entered the breaking water, Jude at the helm, Jack beside her issuing directions. As if attempting to enter a raging river, our cutter slew round with the first onslaught and we ran straight towards the rock retaining wall. “Left! Left! Left!” Rent the air, and Jude furiously put her shoulder to the wheel. Banyandah’s huge rudder responded. The next wave hit. “Back! Close the wall!” Jack urged above the roar. The sea seemed quieter alongside the rock wall than across the turbulent chasm to the Kawatiri Shoals that have claimed so many ships. As our ship responded, Jack jumped to release more headsail to gain additional power to combat the outpouring water that now raise the seas even bigger. Like vessels of olden times, Banyandah crept towards the gap three-houses wide between Entrance Island and Pilot Cape that the first Sarah Island prisoner’s christened Hell’s Gate. 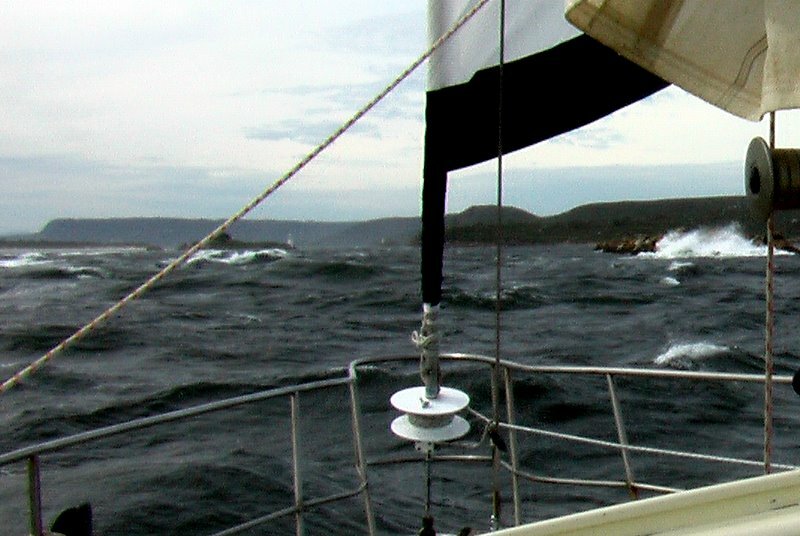 Whirlpools in its maw marked the constant outgoing water, but the mountainous breakers now lay behind us, and in a wink, Banyandah made her third successful entry into Macquarie Harbour. We embraced. “Well done, Sweetie,” Jack kissed her cheek and affectionately patted her behind. But she had little time for his tenderness. The stream had grabbed our lady, demanding more work at the wheel. “Turn right for the leads,” Jack called going forward after another quick caress. 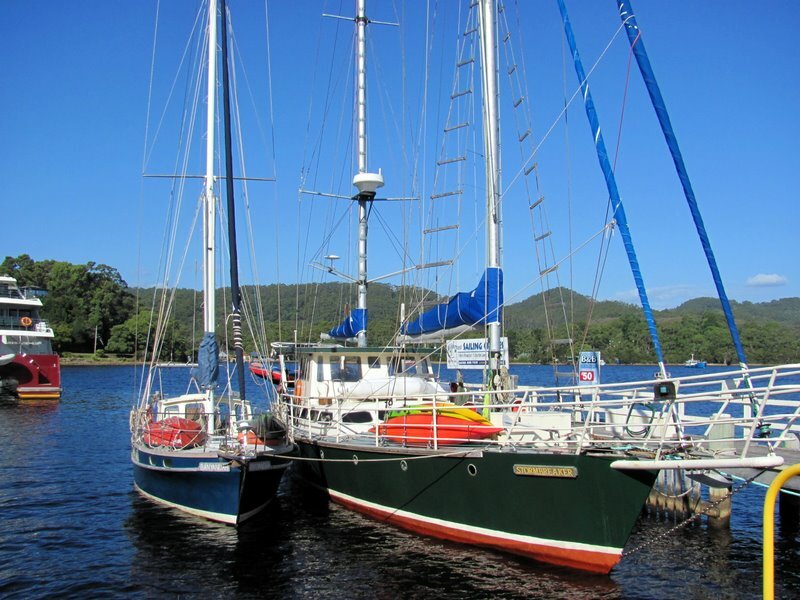 Instead of heading for the township of Strahan, we decided to take much needed rest down harbour in Kelly Basin. With some luck, we may meet a few of our old friends there, or hook up with Chris and Suzanne off Reliance. What a change! Those cool south winds eased and the bright sun brought a holiday mood to the beautiful Three Hummocks Island. 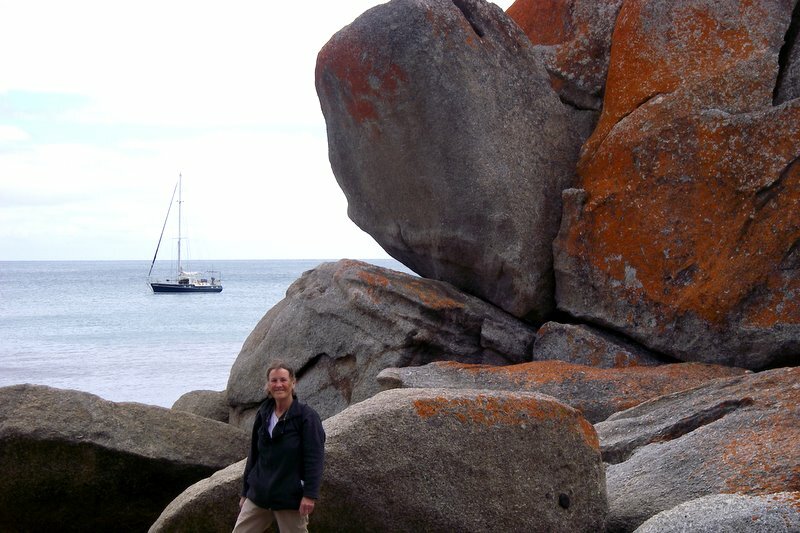 Launching Little Red, Jack rowed his darling along bold granite rocks into a miniature cove at dead low tide. Bull Kelp waved in the easy surge of sea as if Mermaids greeting us, while the hills echoed with the sharp peep-peep of Pied Oyster Catchers. An occasional glimpse of their brilliant red beaks and black bodies hopped atop a few of the boulders. All night we’d heard the continuous yammering of fairy penguins wondering didn’t those little fellows ever sleep. Landing on a sand patch, we set off exploring the uninhabited coast and framed wonderful photos of Banyandah and Reliance, a Sydney yacht sharing our anchorage, between bold bluff stone dabbed with orange and bright yellow against a cobalt sea and baby blue sky. Rowing Little Red felt good. Stretching – using muscles made energy flow and confidence build. This was cruising. To explore using our skills and strength, to witness glorious Nature, as it is everyday, seemed to make the outside world retreat and appear even more mad. Hearing Nature’s sounds, inhaling its invigorating freshness, seeing such vivid un-artificial colours brought sanity back along with an assurance that maybe humans won’t destroy everything before a solution is found to our cancerous growth. Tonight we challenge the seas once again. A mild northeasterly is blowing. The harbinger of a westerly change due the day after tomorrow. 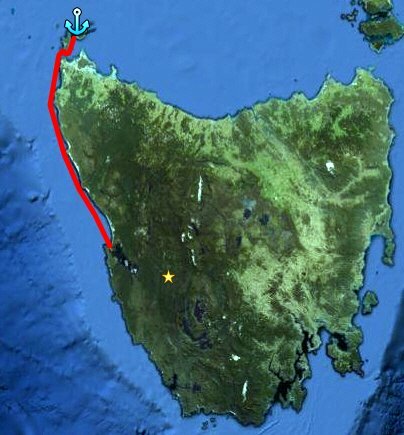 So tonight we sail down Tasmania’s wild west coast to Hell’s Gate. There awaits the real challenge. With strong winds up our behind we must negotiate that much feared narrow entry. It’s not quite like riding a bike. Our sedentary winter has taking its toil and finding our cat-like balance and energy reserves is proving elusive. 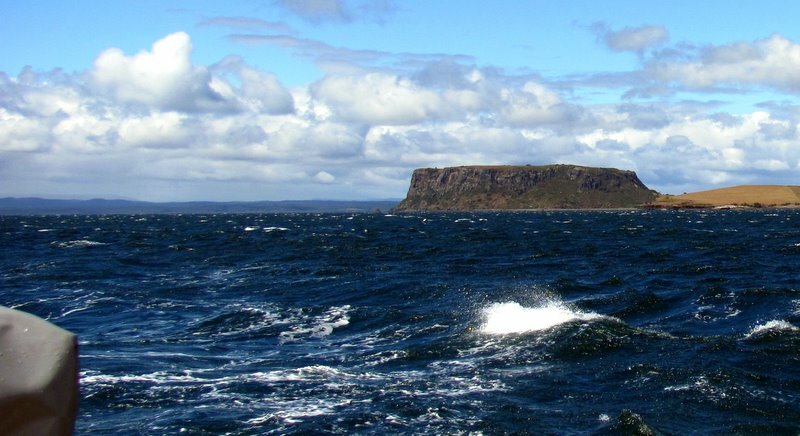 Nevertheless, on day two, with winds still forward of our beam we sailed past the Stanley Nut, its sheer basalt sides glowing in low morning light. Then passing the last slip of land, naughty green seas slopped aboard. Fearing another wetting, a moan escaped our lips. Sucking in a quick breath, Jack shucked his dry garments then quickly braved the foredeck to reduce the mainsail down to number 2 reef. 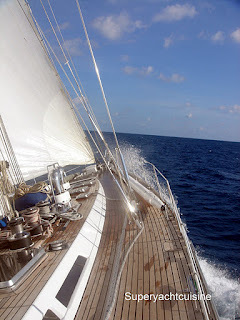 Instantly Banyandah rewarded us by standing upright and began plowing even faster through the seas that now shone Caribbean blue as the patchy clouds were whisked away. The sunshine grew so bright, crow’s feet wrinkled our faces while its intensity burnt noses still tender from their last blast. Ahead, the seas were searched for our destination but we saw only sea birds marauding in clouds that formed then stretched thin, searching like us. Boredom set in. Weariness too, wondering we’re we getting a tad old to be bashing through seas, clinging, standing, trying to find comfort for our achy backs. While hating the incessant shake of our incorrectly set new headsail. 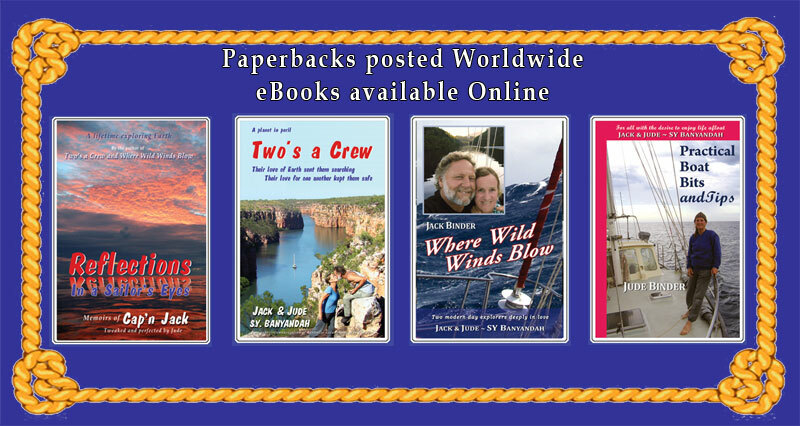 The whole boat shook, so again Jack threw off his gear to gingerly go forward and barber haul that sail’s control line down to reduce the sail’s twist. That helped. The shaking stopped. Another knot was added to our speed. Banyandah’s bottom must have been washed clean of her winter weed for she plowed through the seas like a stable-bound work horse. An easy cracker and cheese lunch saw the first of the Three Hummocks rise above the horizon and along with it came wind of additional strength. But we had planned well. 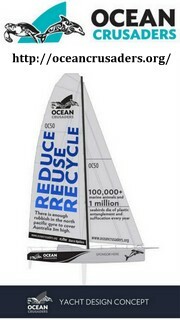 We’d gained upwind ground and could now lay off to run with sails more free. Faster and faster. Closing the island to find a safe haven after threading between island and a nasty submerged rock. Back to Mermaid Bay, where we’d anchored only seven months previously with Lyn and John. A wee bit of motion rocked us in the strong wind blowing off the beautiful green island laced with those amazing granite rocks dabbed with orange algae. Duty called straightaway. We’d lost a batten somewhere in our first two days under sail. And that pesky new headsail had to be sheeted correctly before it destroyed more than our peace. After that, we looked forward to being early in bed. 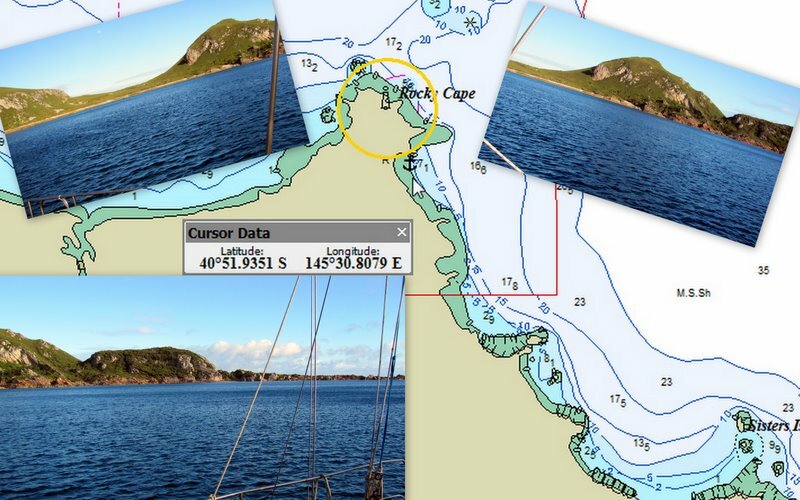 After an enjoyable albeit hectic Christmas, we have finally cast loose the mooring lines and departed George Town Tasmania, into what was suppose to be a pleasant off the land breeze. Aah the weather gods had been waiting for just that moment to unleash a real humdinger wind storm and by days end we were drenched, wet below, a few bits of gear damaged and limping into a hideout behind an isolated cape. Rocky Cape. Such is sailing the high seas. But we are away and beauty surrounds us, Even managed to catch a few of the remaining fish for our late dinner. A good nights rest found our bodies sore and stiff, so a lay day was declared. 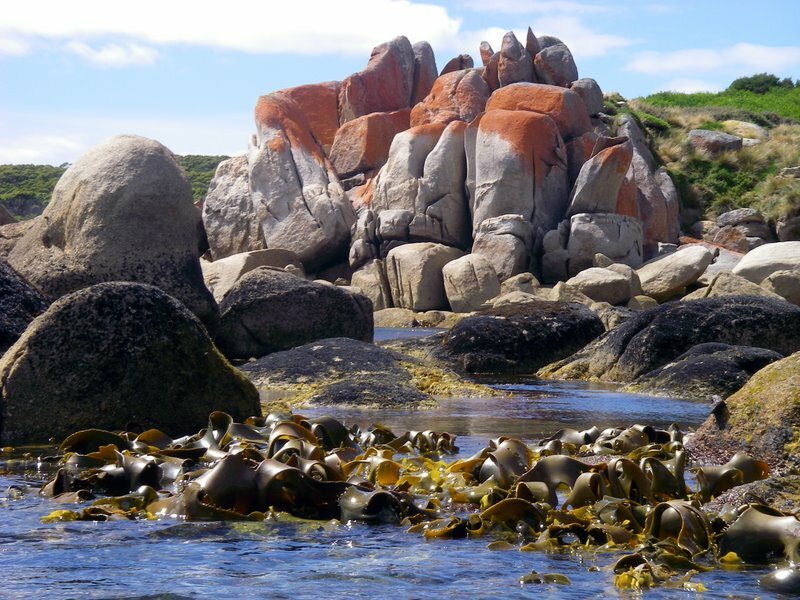 Time to soak up the beautiful uninhabited rocky coastline, and catch a few more fishes for our dinner table.